The Loughrea Arts, Recreation, and Culture group (LARC ) is pushing ahead with its mission of seeing the Town Hall reopened as a multifunctional space for the Loughrea Community. LARC was established following a public meeting on April 24 in the Loughrea Hotel and Spa. The meeting was a resounding success with Senator Lorraine Higgins quickly backing the group’s aims and facilitating a meeting with the Minister for the Environment and Local Government, Alan Kelly. Minister Kelly leant his support to the group after a brief presentation, and promised to back them every step of the way. However, with the minister having his hands full with the debacle that is Irish Water, and Senator Higgins embroiled in her own mission surrounding the introduction of legislation dealing with cyber bullying, members of LARC have pressed ahead to the next step of the process on their own. The group did experience a minor setback lately with the news that there is no Leader funding available for them until the end of the year. The group were hoping to receive some financial assistance in conducting a feasibility study regarding the opening of the hall, but have not let this stand in the way of progress. LARC are confident that they have the expertise within their own organisation to compile as much of the study as possible themselves, and plan to have a professional look over it at the end of the process for a fraction of the cost. It could save them money in the long run, because any funding Leader supplied for the study would have been subtracted from the allocation it gives later towards the refurbishment of the Hall. Added to this, LARC, alongside several community groups from Loughrea, will hold a series of events over the next few months in order to raise awareness and much needed funding for the Town Hall project. On Saturday August 15, Baffle will run a poetry competition with the theme of the Town Hall. On August 28, local artists will showcase their original works at a fundraising gig in An Sibín. Some of the artists involved include renowned singer songwriter Ultan Conlon and The Clockworks. As part of culture night, LARC are in the process of organising an outdoor cinema experience on September 18. The venue is yet to be announced. On November 7 in the Loughrea Hotel and Spa, a large number of community groups will showcase the diverse talent that abounds in Loughrea in an event not be missed. The Loughrea Town Hall was built in 1862 by the architect Samuel Usher Roberts under the patronage of Lord Clan Ricard. It was gifted to the town of Loughrea in the 1920s by a Lord of the Clan Ricard estate at a ceremony which took place in Portumna County Galway, attended by Princess Anne. It was refurbished in 1931 for use as a cinema on the ground floor and a ballroom on the first floor. The hall remained in use until the late 1980s but has since been closed. It was sold to the Galway County Council at the beginning of the millennium by members of the Loughrea community for a price of €110,000. 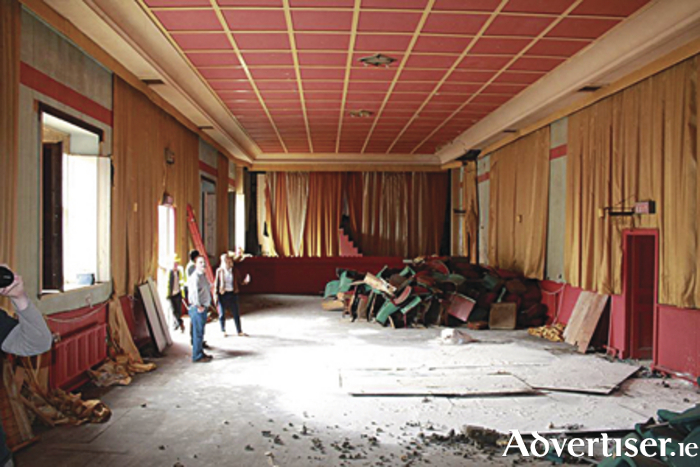 A lack of investment has seen the building fall into disrepair. LARC believe that it is the obligation of the County Council to bring the building up to a usable standard for the local community, and are prepared to work with them in achieving this goal. For further information visit LARC’s new website www.loughreatownhall.com. You can also find information on the ‘LARC’ Facebook page. How do you solve a problem like county representation?